The Game is the Same and the Rules Don't Change—So Why Do the Controls? In basketball, it was the three-point line, or the reintroduction of the zone defense. In baseball, it's the designated hitter, or an All-Star game played for stakes. In American football, it's instant replay, or the two-point conversion, or moving the goal posts to the back of the end zone. All sports have confronted and incorporated epochal changes in how they are played, many within our lifetimes. Sports video games seem to do it every year. Friday, 2K Sports revealed a revision to the controls in NBA 2K13, a remarkable midstream change for a game that hasn't had a competitor since 2010. In quick summary, the left trigger on a console controller last year initiated freestyle ballhandling moves with a corresponding gesture on the left thumbstick. Now the left trigger press is responsible for shooting once you push on the right thumbstick. A right thumbstick gesture alone will create a ballhandling move. To those who don't play this series, the significance of the change may be hard to grasp. For those who have played it for several years, though, it's akin to re-learning the basic, physical fundamentals of playing basketball before tip-off of the next season. It seems that only sports video games are faced with this prospect, even though other series—Assassin's Creed and Call of Duty most notably—release every year and confront the same obligation to grow their audience in the mainstream. Though it is perceived as a year-in-year-out consistent performer, MLB The Show is maybe the most notorious case, with wholesale changes to its pitching systems in each of the past two years. The curveball has been in existence since at least 1870. How you throw it in The Show has been different in 2010, 2011 and 2012, thanks to the game's pitching meter, analog pitching and, now, "pulse pitching" systems. All three require a discrete sense of familiarity and timing to throw a breaking pitch accurately. In basketball, I expect to explode naturally off of a fake toward the basket. It's as instinctual to a slashing guard as it is to an assassin. The difference is that MLB The Show, to its great credit, has probably the most broadly accommodating control systems in a console sports simulation. The old command sets can still be enabled in the current version of the game. Those who have played this series since 2009 can still adjust its preferences and control the game the way they've always played it, even in online multiplayer. NBA 2K13, however, will not include a legacy control set, even though it is presumably making these changes for the same reason—accessibility to and accommodation of a larger audience. Both NBA 2K and MLB The Show have been lauded for being highly technical depictions of a real sport while being criticized for placing a high barrier to its enjoyment before casually interested fans. NBA 2K13, despite being the clear and dominant leader in basketball video games, still is under enormous pressure to expand its audience. The drafting of hip-hop entrepreneur Jay-Z, to be the game's executive producer, speaks to that mandate. There's a difference, though, when you're selling a game based on superheroic acts no one performs in real life, and one attempting to replicate performances seen every day. Familiarity, in this case, breeds expectation, if not a false sense of expertise. In Assassin's Creed, I don't know or necessarily care what kind of animations Altäir or Ezio or Connor could or should branch out of when he's engaging an enemy, because I don't watch knife fighting on ESPN or engage in it down at the Y. This, however, is a constant talking point in sports video games, basketball particularly. In one-on-one basketball, yeah, I have a total expectation of being able to naturally change my player's dribble and explode off of a fake toward the basket, because that is an act just as instinctual to the slashing guard as it is to an assassin. In a video game I'm supposed to be portraying both, but in a sports video game, I'm approaching the role with a deeper familiarity, if only visual. And a non-gamer, i.e. the new, unconverted customer who watches Kevin Durant or Blake Griffin on TV, has the same expectation, if not more. I've had no hands-on time with NBA 2K13 but the description of its new controls already appeals to me. Anyone can take a shot in basketball; creating one is much more difficult. Movement in a sport like basketball involves both halves of your body, upper and lower. It seems more instinctive to split control of that, rather than your shooting behavior, between two sticks. 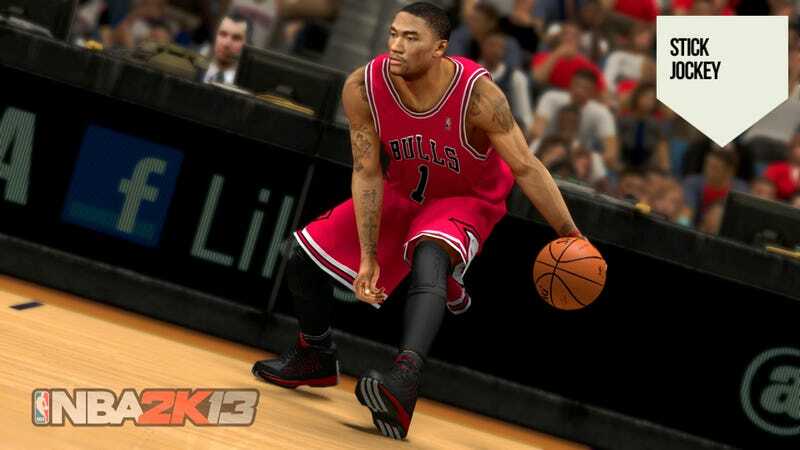 Some have compared the new concept in NBA 2K13 to NHL's skating and stick-handling system. I've heard others reference NBA Live 10. None of this is necessarily a bad thing, nor is refining the controls to invite a larger audience. But at some point year-to-year revisions disrupt the base population more than they grow a new one. Sports culture venerates the knowledge and application of fundamental skills, yet sports video games seem to abandon and remake them year-to-year.